How is your summer going? We have been taking a few over night and day trips. 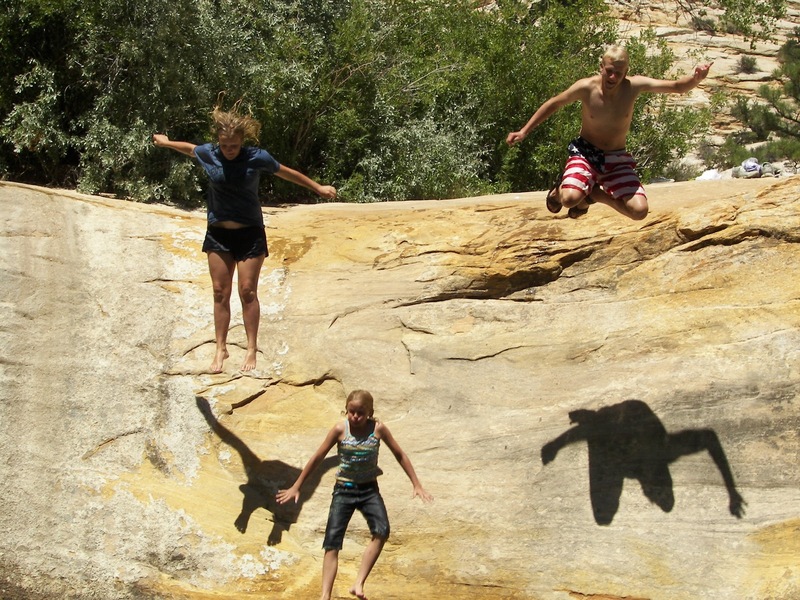 The above photo is from Upper Calf Creek Falls -- a favorite hike with our family. The hike down has some slick rock and is quite an easy hike once you get past the slick rock. 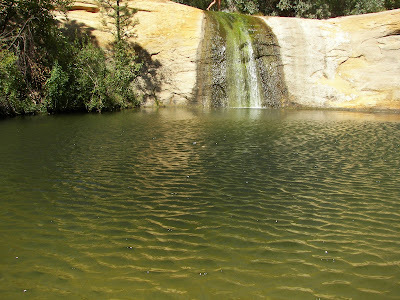 At the end of the hike, you are rewarded with a refreshing waterfall pond. On this particular day we had 90 minutes to ourselves before twenty-four people arrived -- yes, twenty-four! You feel as if you are in a tropical oasis in the desert. The way back up is more strenuous over the slick rock, but if you have dipped in the pool, you will be cool most of the way up. Bring lots of water and sunscreen. 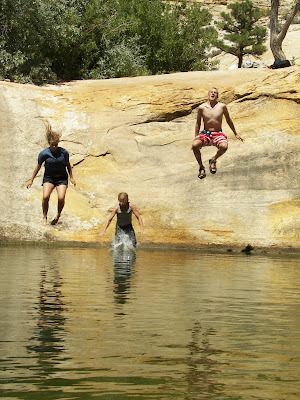 If you have forgot your bathing suit, just jump in with your clothes on -- many people do. I had some fun taking photos of my lambs jumping. The sun was just right for shadows. Calf Creek Falls is on Highway 12 near Boulder, Utah. It is located in the Grand Staircase-Escalante National Monument. Some people slide on the waterfall into the pool. I am not telling you whether I did or not. 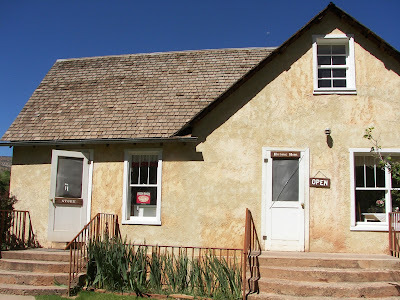 About an hour away from Calf Creek Falls lies the little town of Fruita, Utah. 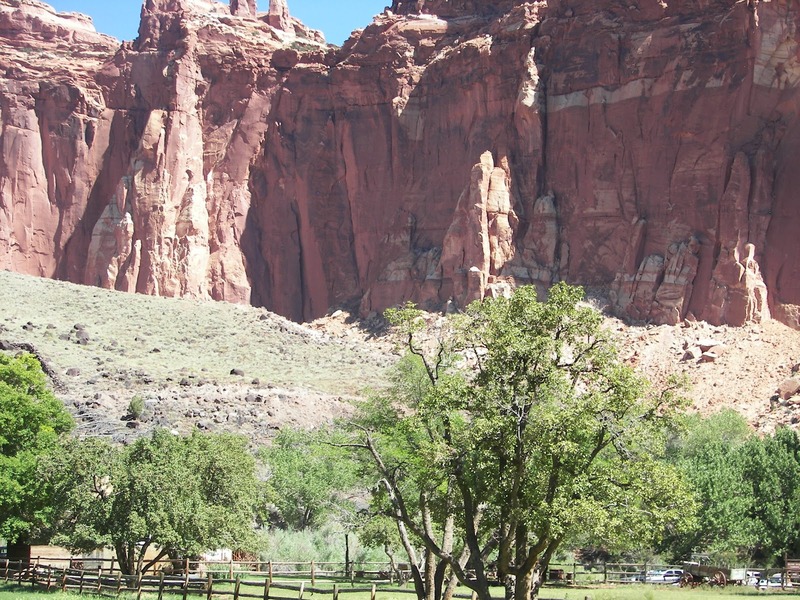 It was settled by Mormon Pioneers and it was abandoned in 1955 when it became part of Capitol Reef National Park. Although the people left, the orchards remain; there are about 2,500 trees. The orchards are preserved and taken care of the National Park Service as an "historic landscape." 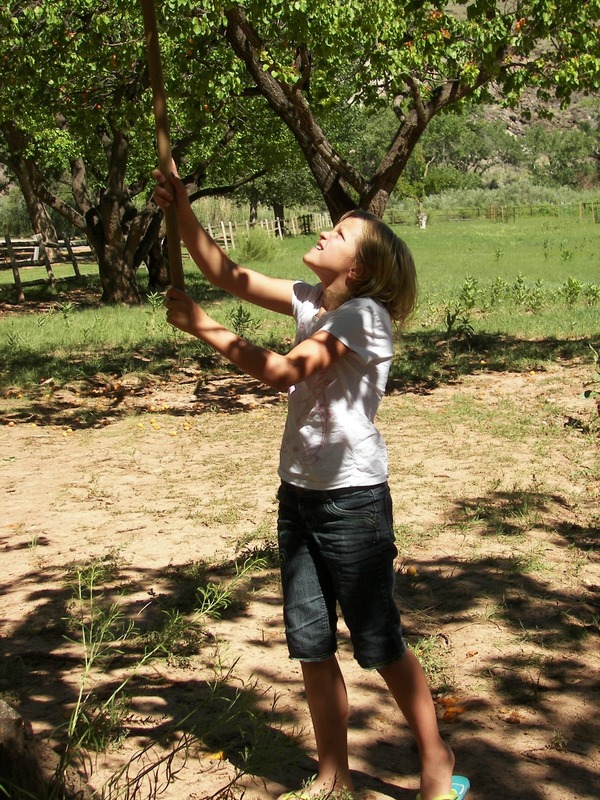 The park maintains a "U-Pick" operation; apricots were a $1.00 per pound. Talley, my youngest picking apricots. 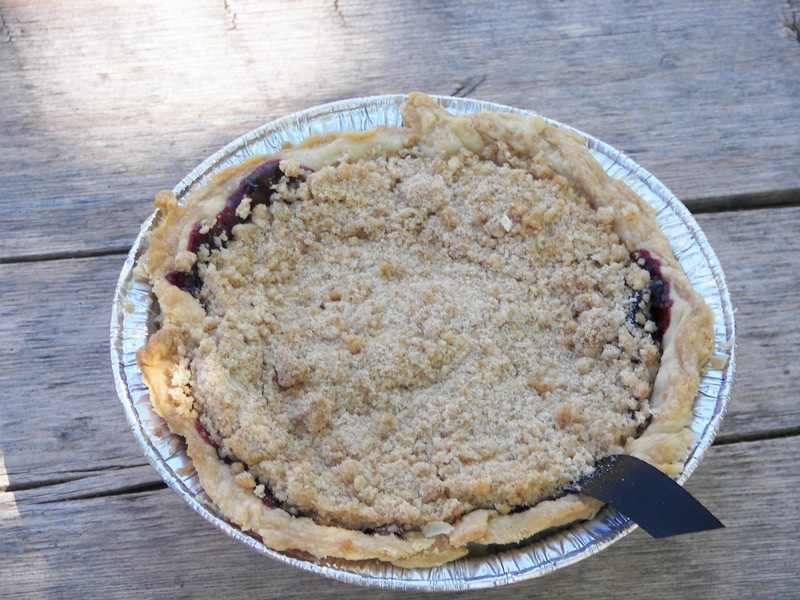 The park service has a gift shop; we can't resist their pies sold in this home. This is a blackberry one which we consumed readily. Although a bit pricey, they are very small, at $5.00, they are very delicious. I hope you enjoyed out little day trip. Thanks for dropping by my Red Couch. Oh Joni, that looks like such a fun place! I love that first pic...just makes you smile to see kids having so much fun! The waterfall is gorgeous to....how fun to have had it to yourselves even if for just a little while. This sort of reminds me of Slide Rock Canyon in AZ...or maybe just of our trip there. We had one of the best days ever there several years ago. I'd have been sliding down that waterfall - you bet! Hi Joni! what a neat place! We toured your state back a few months ago, before it got so hot! :) Just beautiful. I had never seen mountains like that before and even saw some snow on some of them. 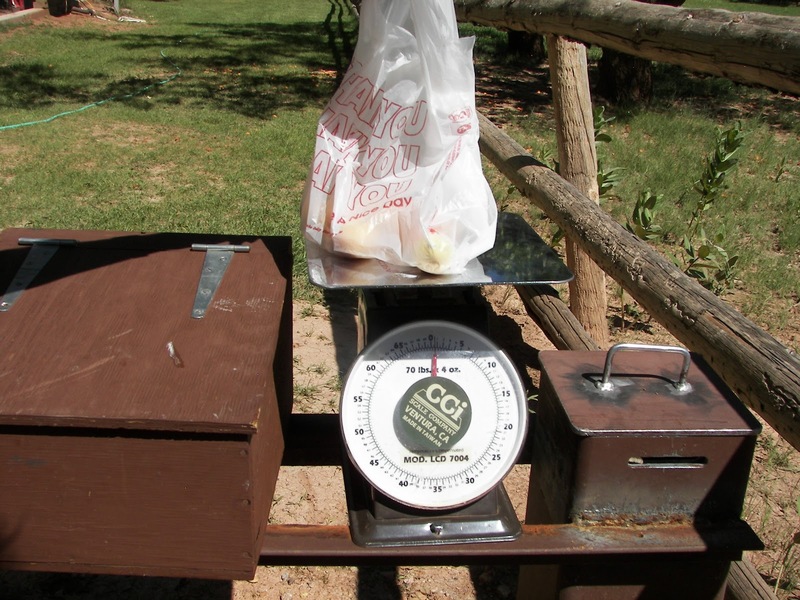 Oh,yes, live chickens or roosters will work just fine for the party. I do hope you'll come. I keep opening one post after the other from your beautiful side of this country that makes me want to visit so badly. We have nothing like that here. We do have some shoals that we can slide down, but I haven't done that in years. Scratch that. DECADES. I'll bet you rode the falls! How fun! The slide looks really fun and I bet you did!!! I haven't heard about Fruita, how fun that they kept the trees and have been selling fruit. The apricots in Lindon are all out in abundance. The pie looks so yummy. What a fun time. Thanks for the little trip to Utah! 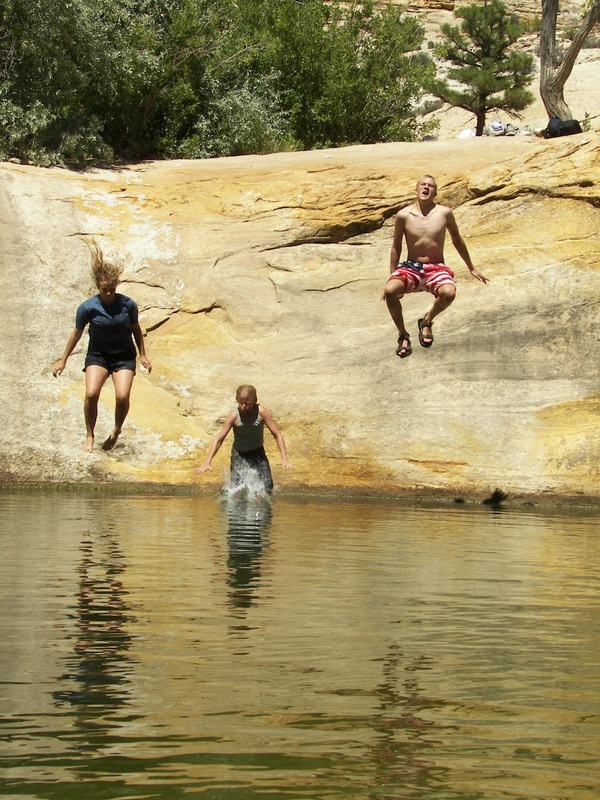 It looks like so much fun to jump in the water! Even though the pie was a little expensive, the apricots were a great buy! The picture of the former Mormon community looks gorgeous with the beautiful rock formation in the background. 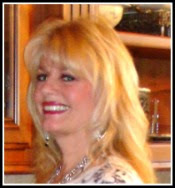 You are making such amazing memories for your family Joni. 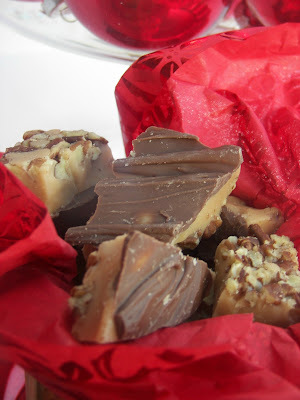 Thanks for such a fun post! Utah has so many beautiful national parks! Lucky you:) Looks like you had so much fun with your family! 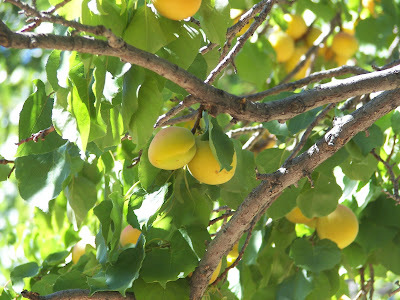 Apricots are SO much better fresh off the tree! Sure looks like you are enjoying your summer Joni! Great pictures! Congrates on your chickens! You will have lots of fun raising them! I have 2 hens. They are now 20 weeks old. We did have a third but "he" turned out to be a beautiful roaster and we can't have them in our neighborhood. To loud! Keep me posted on how they are doing!